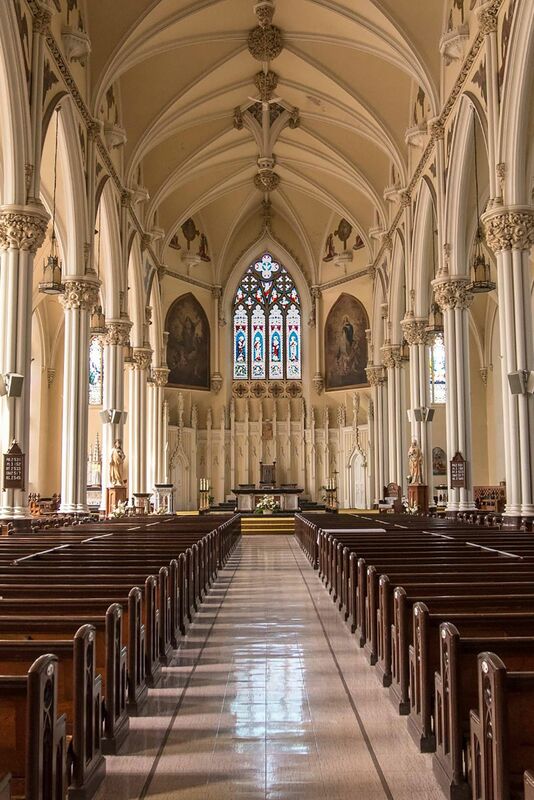 Welcome to St. Mary’s Cathedral virtual tour! 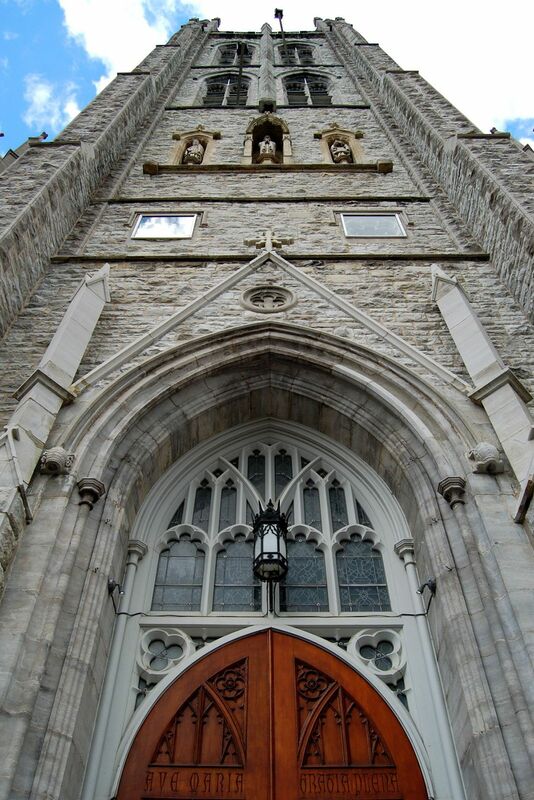 You are entering a building which has been dedicated to the worship of God for over a century and a half, a building constructed of stone quarried from the ground on which it stands, and a building which houses the Chair of the first Roman Catholic Bishop in English Canada. We invite you to explore the beauties and enjoy the peace of this lovely church, and to say a prayer for those who minister and those who worship here. …you are fellow citizens of the saints and members of the household of God. You form a building which rises on the foundation of the apostles and prophets, with Christ Jesus himself as the capstone. The Diocese of Kingston was founded in 1826 by partition of the Diocese of Quebec, and comprised the whole of Upper Canada west of the Ottawa River. Its first bishop was Alexander Macdonell, previously Auxiliary to the Bishop of Quebec with responsibility for Upper Canada. The size of the original diocese can be judged from the fact that the dioceses of Toronto (1841), Ottawa (1848), Peterborough (1882) and Alexandria (1892) were subsequently carved out of it. Nonetheless, Bishop Macdonell had to make do with the old St. Joseph’s Church for his Cathedral. 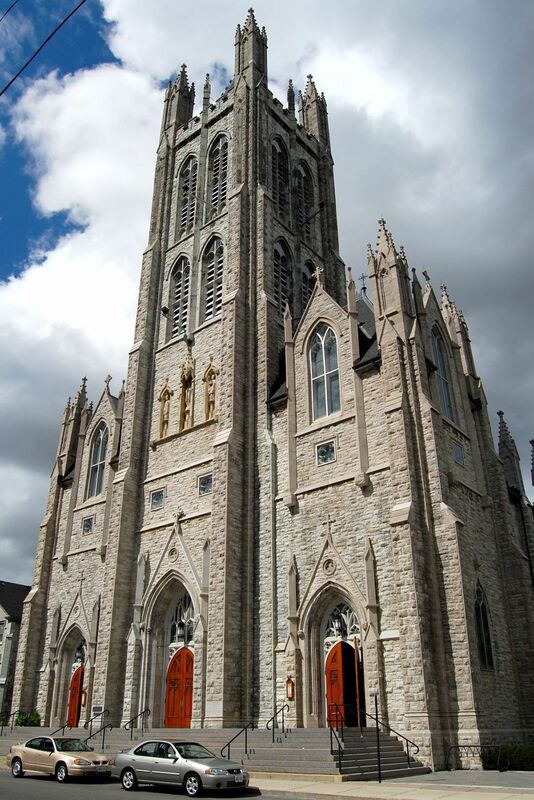 Plans for a larger building were soon put in hand, and under Bishop Remigius Gaulin, Macdonell’s successor (1840, 1857), work on the new Cathedral began in 1842. In 1843 the cornerstone was laid; in 1846 the building, though not yet complete, began to be used; and in 1848, on October 4th, the Cathedral was consecrated, together with its single bell, Patrick. The Sesquicentennial Mass of Thanksgiving was celebrated on Sunday, October 4th, 1998. The arched windows and the pillars help to support the great weight of the slate (originally tin) roof. The pillars themselves are not of stone, but have a central core of a rough, hewn, tree trunk with wooden moulding around it. Their bases are plaster, and each pillar is supported by limestone blocks which you may see in the crypt. The original roof of English tin lasted for a hundred years, and was replaced fifty years ago by an asbestos shingle. The major renovation of the fabric of the Cathedral started in 1987. The stonework had reached the point of presenting a danger to passers–by, and, when all that needed doing was attended to, the restoration was destined to cost $7,000,000 (the original cost of the Cathedral was $30,000! ), and to take six years. Many limestone blocks were replaced with carefully matched stone; one of the buttresses and much of the north wall had to be completely rebuilt. The asbestos shingles on the roof were replaced by slate at a cost of $600,000, some of which was raised by the purchase of slates by donors whose names, and those of family members, were inscribed on the underside of the slates. The various alterations and additions to the Cathedral are described in what follows. The magnificent central tower stands 221 feet tall to the base of the copper-covered cross, which itself is a surprising eight feet high. Inside the top portion of the tower hangs the single bell. Patrick was found to be cracked during the Second World War, but restrictions on the use of metal prevented its replacement until 1949. The present bell, also named Patrick, is rung by a computerized mechanism, at noon and 6 p.m. for the Angelus, and ten minutes before all Sunday Masses. It can also be rung manually for weddings and funerals. The side towers each contain two spacious and lofty rooms, accessible from the stairs in the Narthex (though they are not normally open to the public). A choir room was installed in 1976 in the lower room on the west side, which, as you will see from the nave, is also accessible from the organ gallery through a door installed in the old window. Unfortunately, the other three tower rooms are not at present utilized; the uppermost room on each side is light and airy, with splendid views over the city, and would make an excellent meeting-room if only there were not so many stairs to climb! Returning to the Narthex itself, the walls of the three parts have been repainted in the same colours and with the same frieze as were used in 1910. The stencil for the frieze was discovered in the tower when it was cleared out for the restoration. The stained-glass windows in the Narthex were donated in 1910, and the Pieta in the west vestibule was donated in 1891 by members of the Hickey family, whose descendents still worship in the Cathedral. The south-end sacristy in the west vestibule was added in the 1980s to facilitate the entrance of processions from the back of the Church. O Lord, hear my voice when I call; have mercy and answer. Of you my heart has spoken: ‘Seek his face’. As you enter the Cathedral, you will no doubt be struck by its lightness and spaciousness. The Cathedral is 210 feet long, 88 feet wide, and ninety feet from the floor to the vault of the ceiling. Originally, the altar stood near the back (north) wall, beneath two tiers of plain glass windows. Seating took the form of wooden benches. Two sacristies were built, occupying the space at the end of the side aisles between the pillars and the outer walls. Somewhat later the main altar with a baldachino was installed, with side altars in front of the two sacristies. This occurred during the episcopate of Bishop Edward John Horan (1858–1874), which also saw the replacement of the benches with the present pews. Between 1880 and 1898 Archbishop Cleary made further changes. He removed the two sacristies and built a new one off the Sanctuary on the west side of the Cathedral. The side altars were moved back against the end walls, and ornamental wooden grilles were placed between the first three pillars on either side of the Sanctuary. In 1969, following Vatican II, the Sanctuary was opened up even further. The altar rail was removed, as was the grille work between the pillars; the main marble altar, which was donated in 1910 by Fr O’Connor of Peterborough, was brought forward for celebration of the Eucharist facing the people, and furnished with a new top. The tabernacle doors and the four angels from the altar were placed in the credence table to the left of the altar. The Last Supper scene from the front of the main altar now forms the front of the Blessed Sacrament altar, before which hangs the original sanctuary lamp dating from 1867. The 1923 marble pulpit, which used to be on the third pillar from the front on the east side, was made into the baptismal font and the ambo (lectern). The Archbishop’s throne, the side chairs and the marble steps were also part of this renovation. The Lourdes Shrine on the west wall and the Crucifixion scene on the east wall were donated in the 1880s, during the episcopacy of Archbishop Cleary, whom we have already seen as an active innovator. However, next to the new towers, his most striking contribution to the beauty of the Cathedral was undoubtedly his replacement of the plain windows by stained glass. O God, we ponder your love within your temple... the people of Judah rejoice at the sight of your judgements. A story attaches to the acquisition of these windows. They were made in England and shipped to the United States, where they were held pending the payment of duty. Archbishop Cleary refused to pay this, and went to Sir John A. Macdonald, Canada’s first Prime Minister, and the windows were allowed into Canada. Nobody knows whether the canny Scot actually paid any duty. The windows are unusual in that they tell the story of salvation from Adam and Eve until the deaths of Saints Peter and Paul. Many of the Biblical scenes are easily recognizable, and the windows are well worth studying. Each window has six scenes and three symbols, and the windows’ story is read from the north~west window (by the Blessed Sacrament altar), down the west wall and up the east wall to the Baptistry. A detailed description of all the windows is available at a table at the back of the Cathedral for those who wish to borrow it. The windows originally cost $1,500 each, but they are thought to be worth $500,000 today. After the restoration of the Cathedral was completed in 1993, work started on the repair and restoration of the windows, now complete. The work was done in a room in the basement, using the same methods as were used a thousand years ago to manufacture and repair stained glass, except for the use of electric heat. The restoration was carried out by Mark Thompson, assisted by Robert Dougherty. The cost, about $5,000 – $6,500 per window, was borne by generous donors whose gifts are commemorated on a plaque beneath each window. Sing a new song to the Lord his praise in the assembly of the faithful. Let them praise his name with dancing and make music with timbrel and harp. The main pipe organ, which dominates the gallery on the south wall at the back of the Cathedral, was donated in 1905 and was the work of the then well-known Ontario firm of Kam Warren. It remained virtually unchanged for the next seventy years except for the gradual deterioration of the moving parts with age. By the mid-seventies the organ was virtually unplayable and in serious need of restoration. It was rebuilt at a cost of about $90,000 by the Kingston firm of Frederick Wm. Knapton and Son. The money was raised in about equal proportions by donations from parishioners and others, and by a Wintario grant. The rebuild saw the restoration of all the moving parts, which involved the painstaking re-leathering of each of the separate motors which controls the access of air to every pipe. At the same time, the opportunity was taken to bring the organ up-to-date. Many ranks of pipes were replaced in order to brighten the tone, which originally had the rather bland and tubby sound more popular at the beginning of the century. The whole tonal scheme of the organ was redesigned, the pipes which were retained all being revoiced, and in many cases moved from one division of the organ to another. A new console (playing desk) with modern player-aids (They were modern in 1975! In the intervening 40+ years, consoles have become much more electronically sophisticated.) 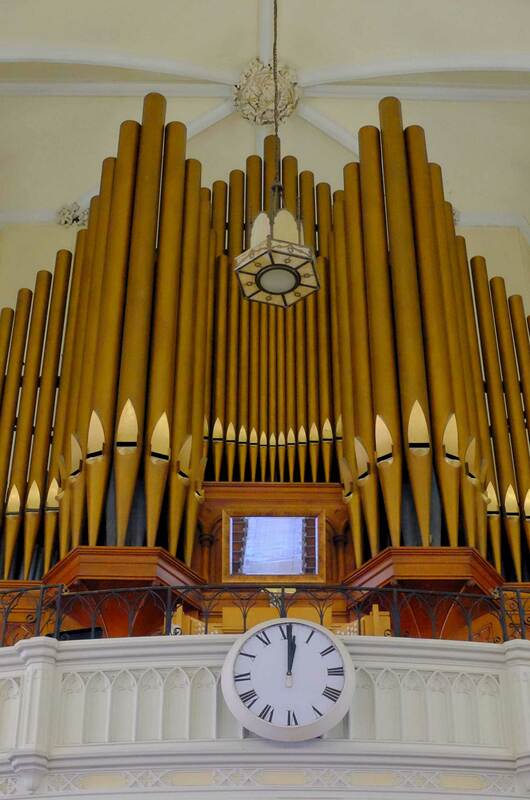 was installed, manufactured by the English firm of Hill, Norman and Beard, which had built the organ in St George’s Cathedral and with which Mr. Knapton had been associated before he set up on his own. The organ has three manuals and pedals (i.e. four divisions) with a total of 47 speaking stops (i.e. different voices) derived from 53 separate ranks of pipes, for a total of 2798 pipes. The action is electro-pneumatic, except for a few of the newer ranks of pipes which are electric. On the right-hand side of the Sanctuary you will see a small pipe organ of two manuals and pedals, constructed by Knaptons in the 1980s. It is used for occasional services when for some reason the main organ is out of action, or when the choir on occasion sings downstairs. It can also be used to accompany small groups or to serve as a continuo instrument in orchestral concerts. Lord, now let your servant go in peace; your word has been fulfilled: my own eyes have seen the salvation which you have prepared in the sight of every people. The sixth Bishop and first Archbishop, James Cleary, is not buried in the Crypt, though his housekeeper is. The records state that he is buried in St James’ Chapel, in a tomb that he had made for himself, but it is empty and no-one knows where in fact he is buried. A possible answer is that he was taken by body snatchers! Around this time, Queen’s University medical students were responsible for providing their own cadavers, and a society of body snatchers grew up to accommodate this need. Bodies were even shipped to the U.S.A.! It would have been fairly simple to lift the floorboards in the Chapel and remove the body. But however plausible this explanation, there is no evidence. Elsewhere in the Crypt are stored the blocks of stone and roof tile remaining from the reconstruction. The steel “I” beams which were installed to strengthen the floor under the high altar when that was moved from the wall to the centre of the Sanctuary are also visible. At one time there was a tunnel leading from the Crypt to Hotel Dieu Hospital, to enable priests to visit patients without going outside. It was blocked up at both ends when it was decided that it was no longer safe. In 1889, during the reign of Bishop Cleary, the Diocese of Kingston was elevated to the rank of Archdiocese and Metropolitan See by Leo XIII. To commemorate this event, the new Archbishop built St James’ Chapel, of which the cornerstone was laid in 1890. The eight stone sculptures round the interior walls depict the first six bishops of Kingston, and Popes Leo XII who made Kingston a diocese and Leo XIII who made it an archdiocese. The Chapel has recently been renovated, using the original wall colouring that was found under the old paint. The gold leaf round each window was also restored, with the use of a stencil made from the original gold~leaf design. The stained glass windows were made in Germany and date from about 1910. They depict mainly Saints and the Holy Family.524 The Chapel is in use daily for the Adoration of the Blessed Sacrament. It is also used for the early morning and evening weekday Masses, smaller weddings and funerals, and special services and prayer meetings. Before the building of Our Lady of Fatima Church, it served as the spiritual home of the Portugese congregation, and now serves a similar function for Polish and Spanish Catholic communities.